In recent years, many animal advocates and lawmakers have championed an “adopt, don’t shop” mentality to encourage potential pet owners to adopt pets from shelters and rescues, rather than purchase pets from stores, many of which have been accused of supplying animals from breeding facilities with poor or even inhumane living conditions. As time goes on in South Jersey, the “adopt, don’t shop” mentality seems to be moving beyond just the mouths of activists and lawmakers and more toward the consciousness of the general public. According to the recent Animal Intake and Disposition Surveys from the state Department of Health, the number of animals adopted from shelters in New Jersey has held steady, even slightly increasing, for nearly the past 10 years. According to the 2005 survey — which licensed animal shelters in the state are encouraged, but aren’t required, to participate in — 37 percent of all dogs and cats impounded were adopted. By 2010, the statewide adoption rate had risen to 41 percent of dogs and cats impounded, and in the most recently released numbers for 2014, the number was higher still at 46 percent. During those same years, the survey shows shelters throughout the state were also able to euthanize fewer animals. In 2005, 39 percent of all dogs and cats impounded in shelters throughout the state were euthanized. That figure dropped to 34 percent in 2010, and in 2014, the number of impound dogs and cats euthanized was down to 26 percent. The support for the “adopt, don’t shop” initiative can also be observed on a base level at local animal shelters through the increasing live release rates, which have continued to climb over the past several years. Live release rates are calculated for shelters by totaling the number of live outcomes for animals at a facility where the animal was adopted, transferred to another facility or returned to an owner or guardian, compared to if an animal was euthanized. In live releases, animals either end up in the home of a new family, or they’re moved to another shelter where space is available because so many animals at that facility had already been adopted. One local facility where the trend is holding true is the Camden County Animal Shelter. 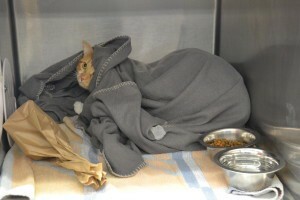 According to Camden County Animal Shelter Executive Director Vicki Rowland, from 2009 to 2015, the CCAS live release rate for cats went from 46 percent to 70 percent. For dogs, the rate increased from 73 percent to 85 percent. Rowland also noted there’s a public misconception surrounding open facilities that have to take all animals, such as the CCAS, where it’s believed it must often euthanize pets and so its live release rates may not be very high. Rowland said that is not the case with the CCAS. The trend of increasing live release rates is also exemplified across the county line at the Burlington County Animal Shelter. Burlington County Public Information Officer Eric Arpert said over the last five years, the BCAS has also seen its live release rates grow fairly steadily. According to Arpert, in 2015 alone, BCAS had a record-breaking 2,602 live exits from the shelter through adoptions, rescue transfers and animals returned to owners. The numbers are also similar at the Animal Welfare Association in Voorhees, where Executive Director Maya Richmond said about 2,700 animals found homes last year. In addition to the rising live release rates, the numbers that shelters have been taking in have also held steady. Regarding the past several years, Rowland said the change in the number of animals coming into the shelter has been negligible. From 2009 to 2015, she said it actually showed a very slight decrease of animals coming into CCAS. “Every year is different,” Rowland said. For the BCAS, which has to work as a no-kill, open-intake shelter and serve all municipalities of Burlington County, Arpert said overall intakes have also been “rather steady” for the past three years. According to Richmond, intake rates have also remained steady at the AWA, as it has more control over what animals it brings into its facilities. However, she said the AWA has had to work hard these past several years to keep its facility full, which has led it to do more to pull from other municipalities. The AWA has been working to keep its intake rates down and keep more pets with their original owners rather than those owners having to surrender those pets. “We do the best we can to see if there’s a way to keep that pet with that family, whether it’s low-cost food, low-cost medical care, and if we can’t keep that pet with that family and it comes into AWA, we find it a home, and that’s well over 1,500 animals a year,” Richmond said. And while intake numbers may have only been steady locally, across the state in the past decade, the numbers actually saw a decrease. According to past state Animal Intake and Disposition Surveys, in 2005 there were 105,355 dogs and cats impounded by shelters in the state, but by 2010 the figure had decreased to 93,914, and by 2014 the figure was 80,346. In addition to the growing “adopt, don’t shop” mentality in the public consciousness, animal welfare organizations also contribute a multitude of other factors to increase live release rates. For the CCAS, Rowland said having cat adoption centers at PetSmart and Petco stores, which are all managed by volunteers, has also had a direct positive impact on adoption rates. The centers — which include the PetSmarts in Moorestown and Cherry Hill — give an animal that may have been overlooked in the shelter a new setting with new potential adopters. Rowland said having a dedicated volunteer board of directors is critical to CCAS’ success, too. “It’s so much pre-planning and strategic planning that is making this happen,” Rowland said. For the BCAS, one obvious contributing factor is the shelter became a no-kill facility in 2013 into 2014, meaning it does not euthanize adoptable pets for need of space. Arpert credits this with helping to increase the shelter’s live exit rates. “There are few shelters that do that, and we’re proud to be one of them,” Arpert said. Another thing that contributed to the BCAS’ steadily increasing live exit rates is additional space for the animals. Burlington County Freeholder Bruce Garganio recently spearheaded an effort to build a new cat room at the shelter, and there have been new dog runs and dog pens added as well. For the AWA, Richmond said a different approach to whom the shelter will let adopt an animal has also helped with placing more pets in more homes. Gone are the days where the AWA would send its members to the homes of those looking to adopt to measure a family’s yard. Gone are the days where the AWA would require five applications be placed by different individuals and families for a single pet before picking what it considering the “best” one. Gone are the days when the AWA would ask for the phone number of a potential adopter’s personal veterinarian to interview as well. While Richmond said the AWA will still obviously decline a potential adoption where it feels necessary, these days potential adopters get declined mostly on the basis that the pet they’re looking to adopt wouldn’t be a good fit for their family or home, and the AWA will instead try to interest them in another animal better suited for their situation. “If you don’t help them, are they going to go buy a pet, are they going to go through other means, and if they secure a pet elsewhere, they might not be prepared to be that pet’s owner,” Richmond said.